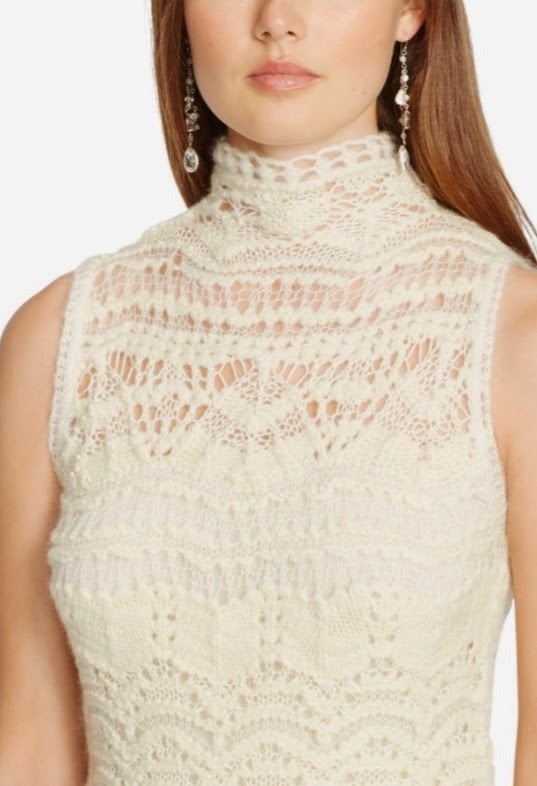 Lace is in the air figuratively, on the runways. 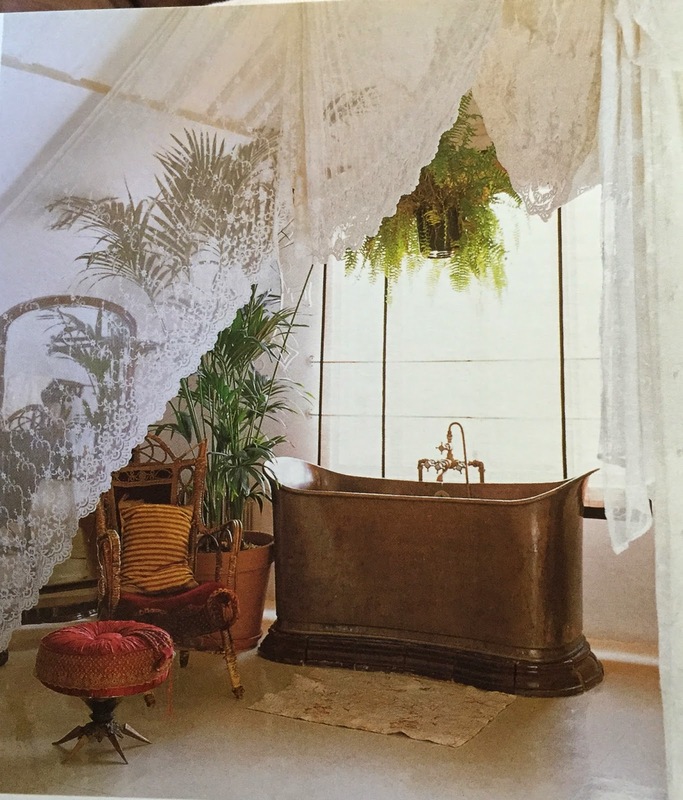 And literally, here above this tub. If you happened to check out my Instagram feed this week, you probably glimpsed a bit of this bathroom. It seems to be channeling Stevie Nicks, and with all those house plants, it has a nice 70s feel in general. So, in more ways than one, it's on the same wavelength with what recently came down the catwalk. This room is also my perfect segue to a new exhibition mention: Nineteenth Century Lace at the Lacis Museum in Berkeley. The recently opened show explores both handmade and machine-made examples, charts shifts in fashion and technique (including a method of embroidering in the air), and delves into how technology helped the lace industry survive turbulent times. Admission is free and the exhibition continues through February 9, 2015. At long last, it's here. In the States, at MoMA. 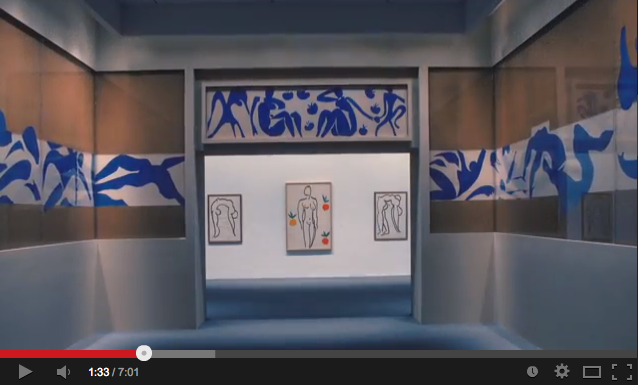 This Sunday, Henri Matisse: The Cut-Outs, an exhibition I've been talking about for months, officially goes on view. Yet another mention may seem annoyingly excessive but a specific feature over at the Museum's microsite warrants attention. 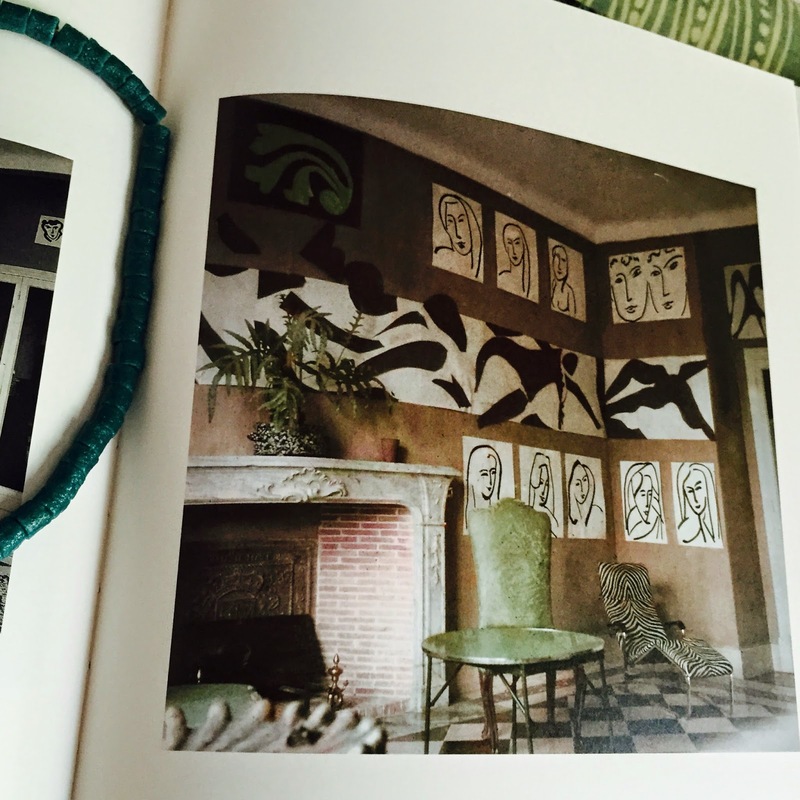 Back in June, I posted designer Amelia Handegan's use of a Matisse-inspired mural in a Sullivan's Island dining room -- just one of countless examples of the modern master's continued impact. Although Handegan had painter Kristin Bunting do the 21st-century frieze in brilliant yellow with white, rather than Matisse's famous blue, she did juxtapose the mural with a neutral wall, echoing how the pioneering artist set his room-spanning paper cut-out, The Swimming Pool, against burlap-covered walls. Now, in this video and on this microsite, MoMA's director, Glenn Lowry, conservators and curators discuss the original burlap used in Matisse's dining room in the South of France, the mural's second life at the Museum (MoMA acquired it in the 1970s), and how the piece has been painstakingly installed for the upcoming show. It's too bad that there's no season three of Man Shops Globe debuting this fall. Remember during season two when Keith Johnson, the show's host, met up with decorator Michael Smith in San Miguel, Mexico? 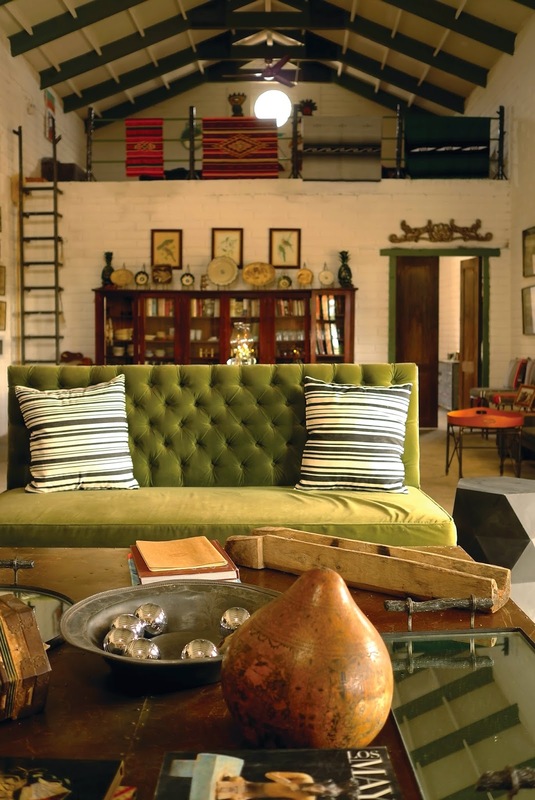 One of their shopping excursions led them to Casamidy, the contemporary-design-meets-old-world-craftsmanship furniture company founded in the late 1990s by Jorge Almada and Anne-Marie Midy. 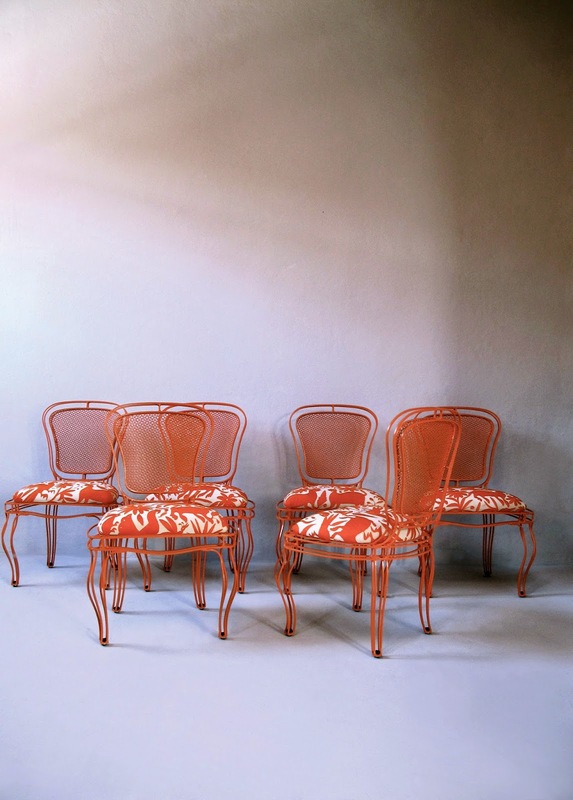 The inanimate star of the episode turned out to be Casamidy's signature iron and metal-mesh piece, the "Manchez" chair, painted red and upholstered in an Otomi embroidered fabric. Airy and graphic, the chair is a riff on classic French forms, but also nods to traditional Mexican style. In short, it embodies both Anne-Marie and Jorge. And its role on the show made many viewers curious to see more of the designing couple's own realm. 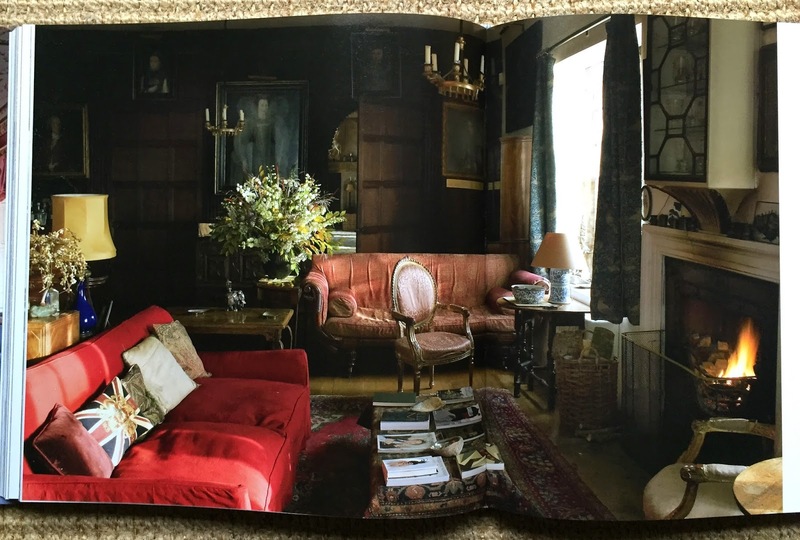 Now, thanks to Rizzoli's new book written by the designers, The Artisanal Home: Interiors and Furniture of Casamidy, a virtual tour of their private world is possible. 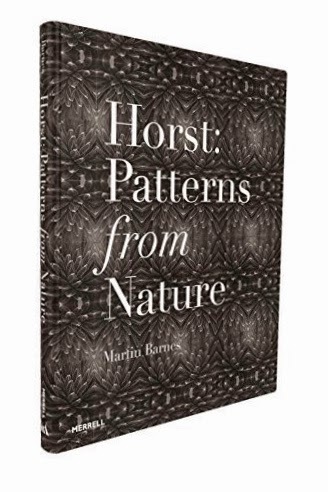 For textile junkies, the book offers innumerable fixes: suzanis, ikats, Provencial quilts, Western florals, Saltillo serapes and of course Otomi embroideries. Jorge explains that he and Anne-Marie tend to work autonomously. He is all about patina, has a penchant for iron, oak and saddle-leather, and describes himself as thinking like a furniture salesperson. In contrast, Anne-Marie can be more poetic (she once had a concept for a line of furniture that "flowed in the wind") but she knows how to collaborate with craftsmen to bring her lyrical ideas to fruition. It's this merging of disparate creative viewpoints that seems to give Casamidy designs their charm. Well, that and the hands of the artisans who make the couple's ideas tangible. The book gives these metalworkers, glaziers, tinsmiths and upholsterers their due, highlighting each artisan by name and image. 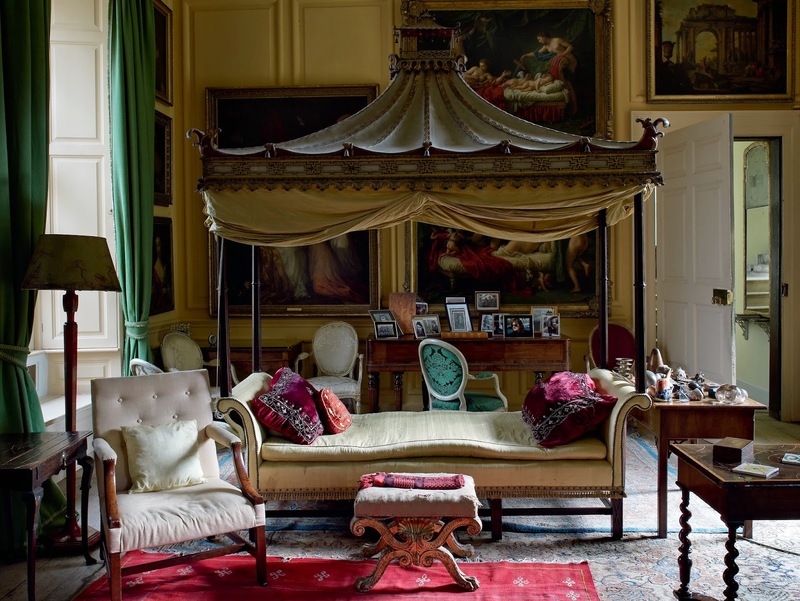 Different sorts of handcrafted furniture, layered textiles and family heirlooms can be found throughout Jeremy Musson's The Drawing Room: English Country House Decoration, an ode to what has historically been seen as a feminine space. Musson takes us through the evolution of the room, from its seeds as a "withdrawing" place to a grander site for courtly entertaining. Ultimately the drawing room becomes a place for less formal gatherings -- today a TV may even be spotted among the layers -- but each interior highlighted is nonetheless rich with color, texture and pattern. 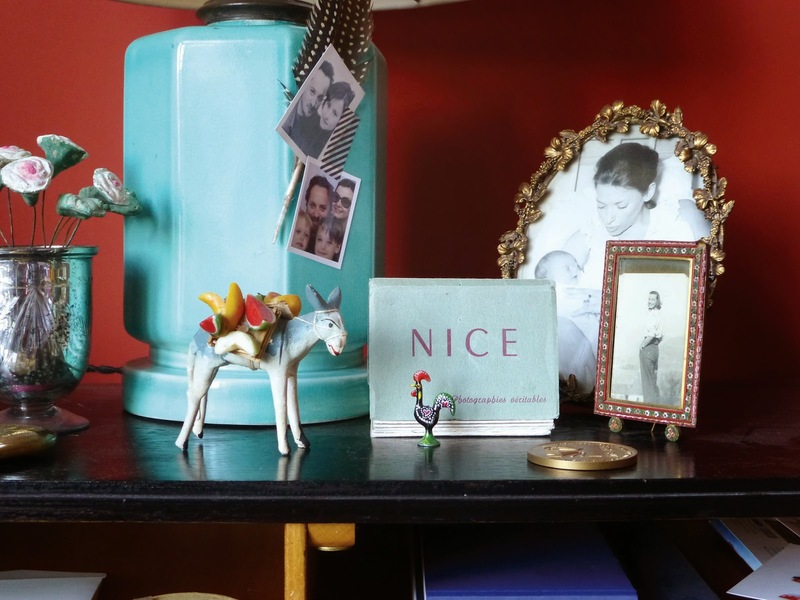 What distinguishes this book from others in the genre is that many of the rooms have contemporary touches. All of the icons are here -- Nancy Lancaster's "buttah" yellow room and David Hicks's The Grove, just to name two. 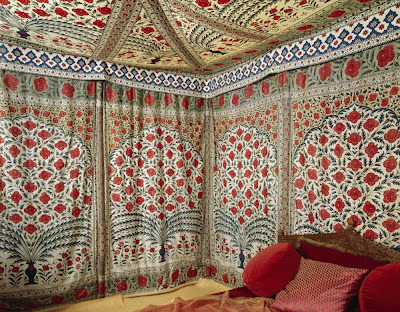 And anyone who paid close attention to the set design in Mira Nair's Vanity Fair will appreciate the twin, chinoiserie Chippendale daybeds at Stanway House (detail-oriented folks will love how the rooms are shown from multiple angles). 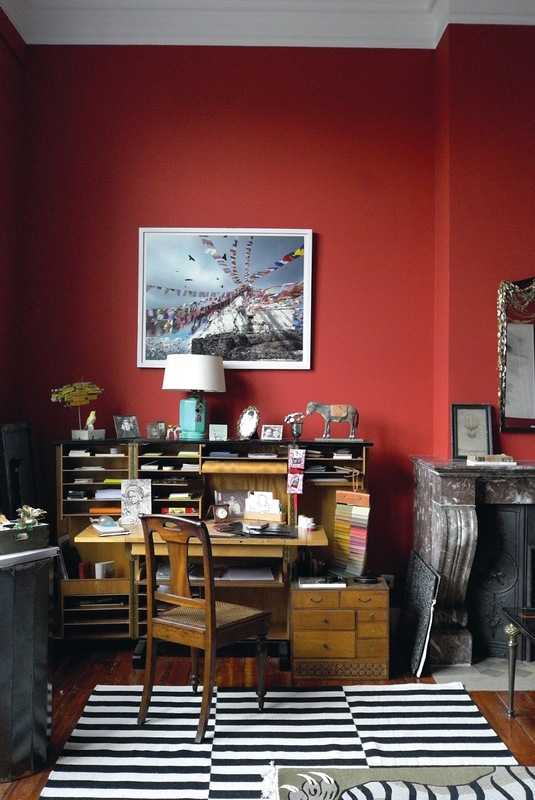 But the unexpected sights of 21st century life make the images especially compelling. 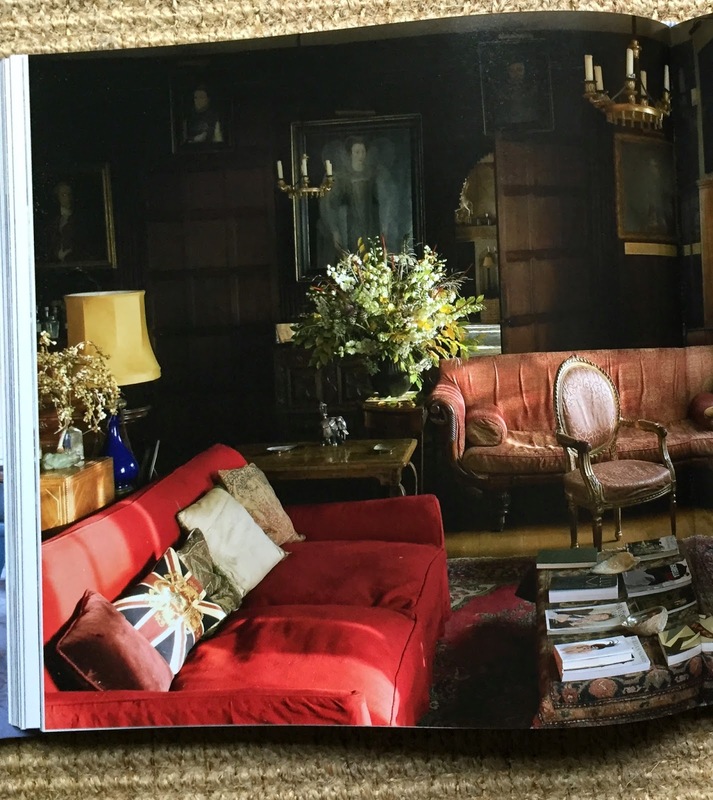 Above, a Union Jack pillow and more recent books and magazine's are strewn about in the Long Room at Hilles House, home of the Blow family. 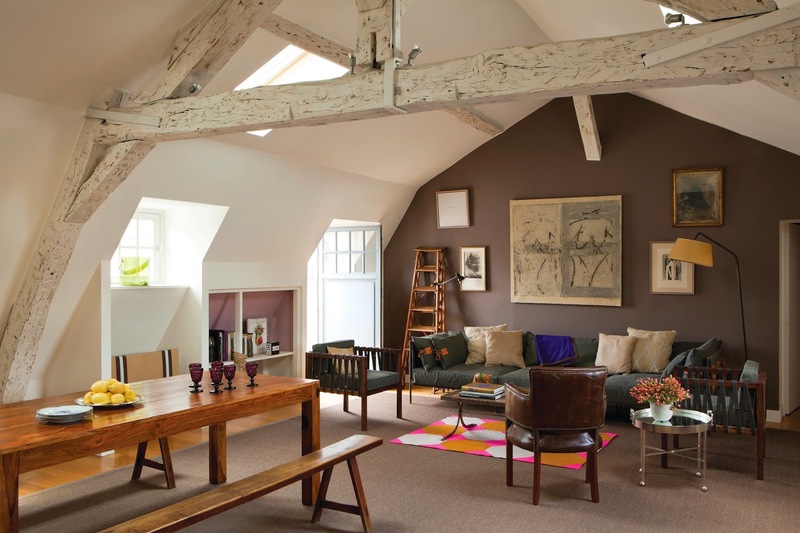 Originally created by Arts and Crafts architect Detmar Blow in 1914, it is a cozier take on an English manor ensconced in the Cotswolds. Think "Modest Manorial," as Musson says. This time next year, textile junkies will want to be in London. From September 26, 2015 through January 10, 2016, the V & A will present The Fabric of India, an exhibition comprised of famed pieces like Tipu Sultan's 18th-century Indian chintz tent (the one with stunning red flowers acquired by Edward Clive in 1799 and installed at Powis Castle in Powys, Wales), myriad folk, court, and made-for-export textiles from the Museum's own collection, and work from contemporary Indian fashion designers. Rosemary Crill and Divia Patel are curating so it will be interesting to see if any of the three embroideries pictured here end up on view in the show. 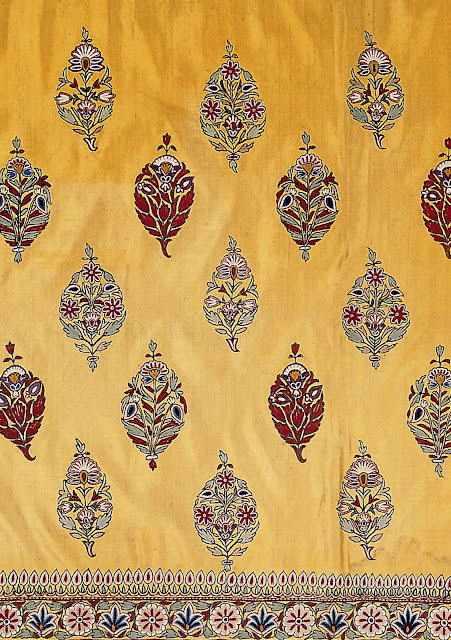 While the exhibition will be large -- the first truly comprehensive show to explore handmade Indian textiles from the 3rd to the 21st century, with more than 200 examples, says the V & A -- narrowing the field of choices is probably still a challenge. 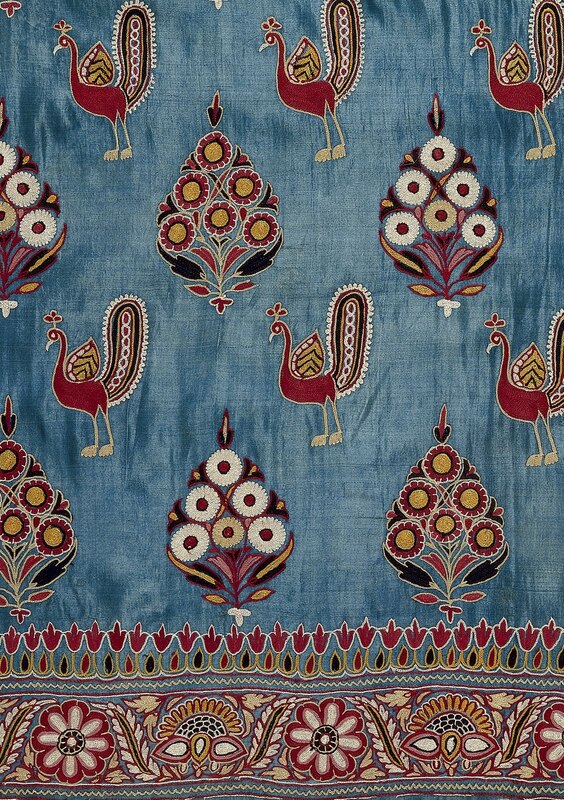 If you're curious about the hurdles curators face while mounting a show of this scale, or you just want to sneak a peek at the objects they are working with, check out The Fabric of India blog. It's already live.